You are stepping up your game as a video blogger, newscaster, interviewer, or just want something that doesn’t have a wire attached to it. The answer – a wireless camera microphone that you can use in any situation. There are many out there, but in this case, going cheap may mean not having the best sound or the interview at all. If you are in a expo hall, there may be several wireless systems competing with yours. That is why I bought the Sony UWPV6 (3032) wireless microphone system. It’s a handset mic and a wireless lavaliere when you need it. Most important, it’s a microphone that adds a professional look to your interviews. I bought it from my friends over at B&H Photo. It’s a great place to go for all your audio, video, and photo gear. Located on 9th st in New York, the store has a great atmosphere, with knowledgeable salespeople to help. We’ll start with the wireless aspect. The unit runs on the 566-590 Mhz range, and can switch up frequencies on a moments notice. You have 188 frequencies to choose from, so you don’t cross with other wireless mics running in the same range. The band is UHF, channels 30-33 on your old TV. Since the device runs on batteries (2 AA for each pack), you can be assured you can get the interview no matter where you are. 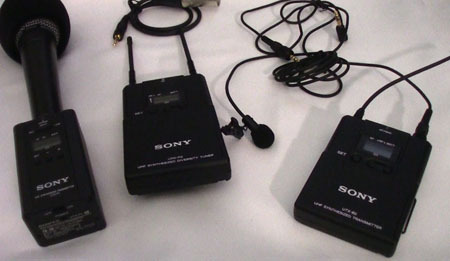 The receiver connects to the camera, and either the lav pack or the microphone adapter will be on the subject or host. 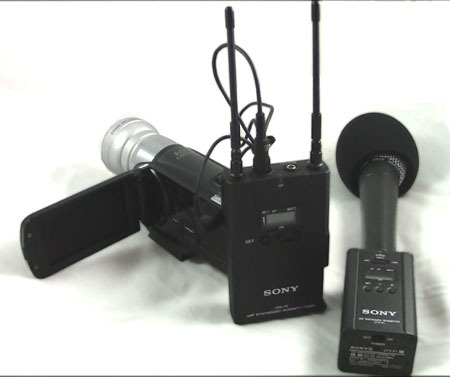 You can switch between the lav and interview mic by switching the unit number – which is also can be customized. The plug-on TX system allows you to use this receiver with your favorite microphone. If you are in a pinch and need to pull from a mixing board or instrument, the plug-on transmitter can do that. Just switch the unit to “line” (a switch on the front). This unit can plug into almost any camera with a 1/8 inch line-in option. I have plugged the camera into a Kodak Zi8, all the way up to a professional grade Sony HVR unit. The packs have individually identified pieces. For example, the receiver on the UWPV6 is a URX-P2. The Lavaliere is UTX-B2, and the plug-in mic is a UTX-P1. That way, if you want to add more units to your microphone, or you lose a part (which a friend did a couple of years back), you can just order another piece. Some stores might even have them in-stock, so if it happens during a show or conference, you can get it either instantly, or next day. It’s a great microphone to have in your gear. You can use it to record audio, plug it in a camera and have around a 15-20 meter range (or longer depending on where you are and what is around you). It’s not a cheap microphone, but once again – you are there to get the interview, so you want a unit that will perform every single time. Many of my interviews in the last year have been on a UWP series wireless mic. From national events like CES and SXSW, to local and personal events. Bottom line – it’s worth the money to look professional and get great audio out of your system.